Virginia Seidel - Call on Dolly! Virginia Seidel : Minnie Fay with Dorothy Lamour, Sheila MacRae, and Sylvia Syms! 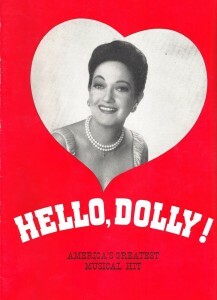 In 1971, Virginia Seidel appeared in Hello, Dolly at the Milwaukee Melody Top with Dorothy Lamour and Jack Bailey. That was her first adventure as Minnie Fay. Virginia started out as a little “brat” at her mother’s dancing school in a suburb of Chicago. As she got a little older, Virginia’s mom decided not to have her around the studio because she was causing trouble. She started going to another school, with a more serious approach to ballet. That led her to getting cast in George Balanchine’s Nutcracker. For two seasons, when they were in Chicago, they cast Chicago residents to round out the cast. Each time, interestingly enough, it was at Easter! Virginia’s mother just happened to know the ballet mistress, Vita Brown. Later on, Virginia got to play a page in the Royal Ballet production of The Sleeping Beauty when she was in the eighth grade. She kept on with her ballet training which is very fortunate because it got her into Actor’s Equity at the St. Louis MUNY Opera. That was the summer of 1968. 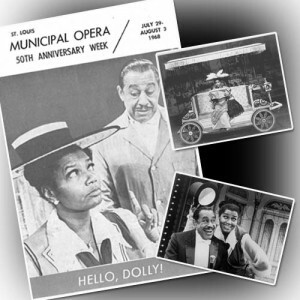 While she was appearing there, Pearl Bailey brought her Dolly Company to the MUNY the week of July 30th. It was a huge hit! The MUNY Company was also thrilled that they had those nights off. They got to see the show. Pearl Bailey’s singing was superb. Later on Virginia also saw Ethel Merman and was blown away by her singing. 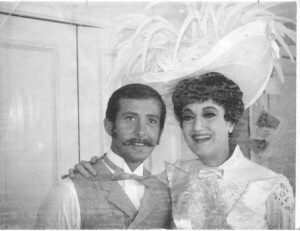 That same summer, Virginia did Call Me Madam with Merman as part of the ensemble. After Virginia the MUNY and moved to New York, Merman was starring in Dolly on Broadway. This was the summer of 1969.
who were about her age. Four women including Virginia decided to room together to cut costs. They were all dancers. Renee Bauman ended up getting Applause and eventually A Chorus Line. 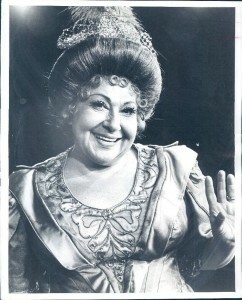 Julie Pars was in the original Follies. Another continued in ballet and opera work. Virginia went along taking classes with Luigi. One of her first jobs that she got in New York was Take Me Along at the Meadowbrook Dinner Theater with Ray Milland. This was before Love Story came out. The director of Meadowbrook Dinner Theater was Stuart Bishop. During the summer, he was the artistic director of Milwaukee’s Melody Top and that is how she ended up there two years later. He had cast her in The Boyfriend with Leland Palmer at Meadowbrook and consequently. Leland was supposed to be Minnie Fay for Stuart at Melody Top but she got cast in the National tour of Applause and she recommended Virginia and Virginia got the part. She was very excited to get cast especially since it was kind of handed to her. She was thrilled. She never thought that something like that would ever happen to her where she didn’t have to audition for something. That didn’t happen a lot after. Because of Virginia’s work at St. Louis Opera and Meadowbrook, she had appeared with stars of Dorothy Lamour’s status. She had appeared with Douglas Fairbanks in My Fair Lady at The MUNY. She did Call Me Madam with Merman, and The Pajama Game with John Rait. There was an ensemble of twenty-four dancers and thirty-six singers, an ensemble of sixty! Virginia was part of that ensemble. As far as being a principal, appearing alongside Dorothy Lamour was a big first. Lamour was so nice to everybody. (Courtesy: Dan Pagel (“Memories of Melody Top”)The Gower Champion choreography was what attracted her most to Hello, Dolly! It is such a beautiful dancing show. 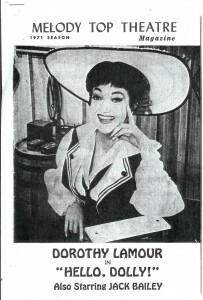 Lamour had done a huge tour of Dolly prior to doing it at Melody Top. This was 1971 and she was 57 at the time. They rehearsed a week and it was in the round outside. This was in the days of Tent Theater. She never had a cross word about anyone or anything. Everything just sailed along. They were so busy that there wasn’t much time for socializing. However, Lamour did throw a party for the company. Her husband was also a very nice man, always helping out with everything. (Courtesy: Dan Pagel (“Memories of Melody Top”)Also, Don George, who was Cornelius, was a very good friend of hers. That was a very good idea. He appeared with her in several productions of Dolly and added to her confidence. 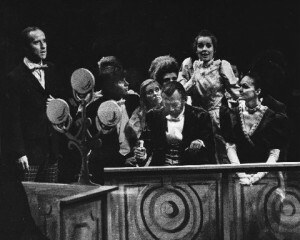 Lamour was also concerned for Virginia after the first act one night. Virginia fell in the pit! She had to bouree, a dance step, backwards. She was doing this step, facing Lamour, as she is saying goodbye, and she fell in the pit. It happened again the very next day! Lamour insisted on them changing that step to avoid it happening a third time. With the original choreography, that was meant to be done in a proscenium where Minnie is backing off backwards into the wings. There was always someone to catch her. In the round, a good portion of that round is a pit. Virginia did not remain in touch with Lamour after this production. It was a typical summer stock production. They rehearsed for seven days and ran for two weeks. Once the show was up and running, Virginia was rehearsing their next production, George M, during the day. 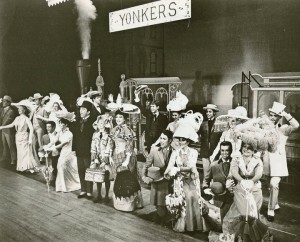 Virginia loved appearing as Minnie Fay in this production as she did with the ones to follow. She loved playing Minnie; Elegance was a favorite of hers every performance. The script is so good. She always got a huge laugh, as she is sure all Minnies have, when Mrs. Molloy desires to take a taxi and Cornelius insists on them walking. He can’t afford it and says, “Really elegant people walk.” Minnie says, “To think I’ve been elegant all of my life and I never knew it!” It is an innocent line but always got a huge laugh every performance. Virginia was not that experienced as an actress when she first played Minnie Fay. She also brought that innocence to her portrayal. The lines just carried her in addition to the very experienced cast she was with. 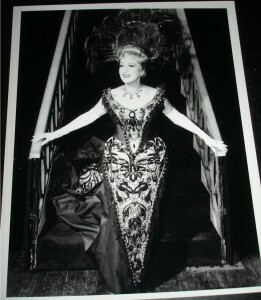 Most had appeared in Dolly previously either on Broadway or on tour. She just slipped right in and matched up with everyone. Minnie Fay first appears mid Act in Act One. After that, she is kind of onstage for almost all of the rest of the act. 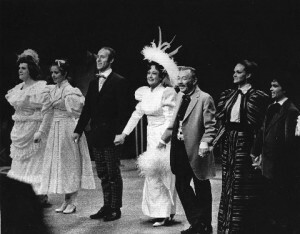 The hat shop scene leads into the big dance number at the end of the act. She learned early on that she really had to warm up in preparation for each performance. She took a dance class each day. It was during Sunday clothes that she was always backstage plie-ing and pointing. She knew, otherwise, she would not have a chance. She has maintained that discipline and preparation throughout her career since then. Virginia was young when she played Minnie Fay and brought that youth to the show. She also had great ballet training. The dancing suited her. She was never much of a jazz dancer. Ballet was the main part of her dance. She was always go grateful to have been cast. Two of the productions were directed by Stuart Bishop. In addition to the Lamour Company, Virginia also did it with Sheila MacRae. That was done at Meadowbrook which followed the Milwaukee Company. Two years later, Virginia appeared as Minnie Fay for the last time. That was with Sylvia Syms. Virginia did audition for the 1978 Carol Channing but did not get it. Truthfully, she was a little too old for Minnie Fay at the time. When the movie came out in December 1969, Virginia saw it. She thought it was very lavish. Of course, Barbra was the youngest Dolly ever. All three Dollys were very different. Dorothy was so beloved by the audiences who remembered her from her film career. They were thrilled to see her LIVE and in person. None of these Dollys were really “singers”. Sylvia was a great jazz nightclub singer. Sylvia Syms was 66 when she appeared in Dolly in ’73 throughout the Boston area. She had also been in a terrible auto accident. The Company was worried as to whether or not she would be able to make it through the rehearsal period. It is an extremely demanding show. She wasn’t a stage actress. Her voice tended to be more of a smoky nightclub jazz sound. She really put across that lower East side type of persona in Dolly. Virginia’s favorite Dollys of the ones she appeared with was Sheila. Dorothy was wonderful, but that was only three weeks. She didn’t really didn’t get to know her. Her run with Sheila was two months and it was during the Christmas season. The theater supplied her with a limousine and she very often brought the four principals back into the city with her after the evening performances. She took them to Downey’s and PJ Clarke’s. She always picked up the tab. Virginia was agog. She had a big Christmas party at her town house. Virginia had never been in a townhouse before in which the owner’s owned the entire building! She was floored. Her daughter Heather was there. She was appearing in Hair at the time. Barnaby and Cornelius’ adventures in New York reminded Virginia of her own experiences of coming from a small suburb and moving to New York City. Even though Virginia grew up outside Chicago and even worked in Chicago as a dancer, everybody desires to get to New York. It is such an optimistic show. It has a wonderful feeling about it. The fact that it has been performed all over the world and continues to be performed is proof in the pudding. When Virginia was younger, she didn’t pay much attention to the fact that Dolly is a widow. She remembers being confused by the name/ Who was she? Levi or Gallagher? She also remembers, at first, wondering “Who and where is this Ephraim she keeps talking to?” Looking back now as an older woman, Virginia realizes even more so how moving those speeches are. Virginia is now a widow herself. It is very touching that she is seeking a sign of Ephraim’s approval for her to marry Horace. Virginia also feels that Jerry Herman has also made such a great contribution to the world. At the top of his reign, it was musical comedy as opposed to musical theater. Virginia has also appeared in Mame as Gloria Upson. The Sylvia Syms tour traveled throughout the Boston area appearing in a chain of dinner theaters called the Chateau de Ville. It was reputed to be mafia owned and operated. People called it Chateau de Vile. They were actually wonderful theaters. They were big theaters with HUGE lobbies. They were nice stages. They had union orchestras. The costumes were gorgeous. The salaries were good. When these theaters opened, the locals were expecting these to be casinos. The hope was that when and if gambling was legalized, they were ready. It, of course, never happened. The final leg of this tour was in Warwick Rhode Island. There were three theaters in the Boston area, one in Providence, and on in Warwick. This was at the peak of the dinner theater boom. It is sad that it didn’t last because it employed a lot of people. It was also great experience. Summer stock was already disappearing from our cultural landscape. Closing night, Virginia had already been out of New York City for six months. It was a good job, but everyone was anxious to get home. Things were winding down and it was time to go home. Because Sylvia was an older woman, there weren’t a lot of parties with the cast. She needed her rest. She wasn’t hanging out with the cast. of Lowell Purvis, who was one of the dancers in the show. 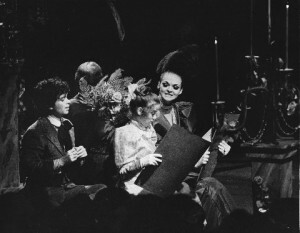 Dolly had three stage managers, Pat Tolson, Lucia Victor, and Jack Timmers. When Virginia auditioned for the Chateau de Ville Company, they did not know her. She came in and read initially. They had her come back and dance for them. Before she walked out of that audition, Timmers said to her, “Where have you been all of our lives?” As if to say she was a great Minnie Fay and they had never seen her before. Perhaps she would have been a Broadway Minnie if the opportunity had presented itself at the right time.